Gender integration is essential for the successful growth of the aquaculture and fisheries sectors, and female empowerment is a core development objective of the United States Agency for International Development (USAID). With a long-standing commitment to creating meaningful opportunities for both men and women in the aquaculture and fisheries sector of the developing world, the AquaFish Innovation Lab works to align its program-wide gender integration strategy with the current paradigms and initiatives in the development arena. Women and men need equitable access to assets and opportunities such as water resources, financial capital, knowledge of new production systems and skills, markets outside of regional gender boundaries, and participation in stakeholder groups and meetings. Women are involved in every aspect of AquaFish Innovation Lab work, from administration to research and education, as the program more broadly seeks to advance the development of responsible aquaculture technologies and systems through investment in research and capacity building. Since inception, disaggregated gender data derived from projects has informed continuing research, resulting in steady improvements in women’s participation. Benchmarks are set and data are actively collected to track the involvement of men and women in leadership, training, and long-term degree programs. To achieve the highest potential value of aquaculture development, equal contributions of men and women are necessary. The AquaFish Innovation Lab continuously fosters this goal by laying the groundwork, year after year, for participation and leadership development for women. 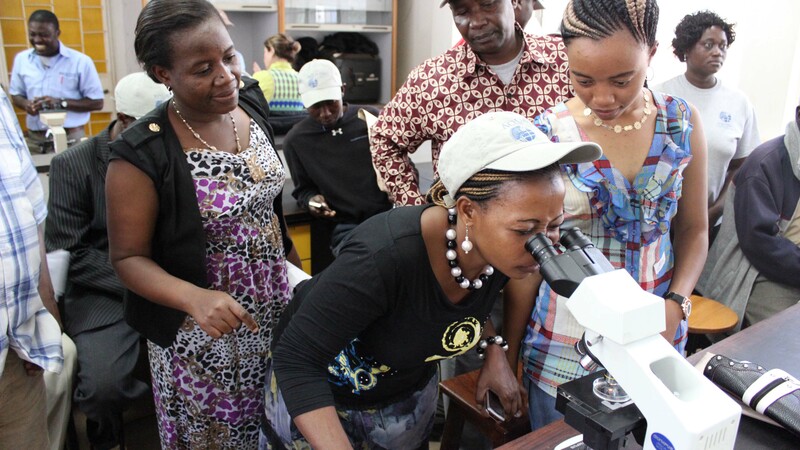 Women workshop participants examine plankton samples at an AquaFish Innovation Lab-sponsored workshop in Tanzania. Food and Agriculture Organization of the United Nations. (2013). Policy on Gender Equality: Attaining Food Security Goals in Agriculture and Rural Development. Rome, 2013. United States Agency for International Development. (2012). Gender Equality and Female Empowerment Policy. Washington DC, March 2012.
International Food Policy Research Institute. (2012). Women's Empowerment in Agriculture Index. The World Bank. (2009). Agriculture and Rural Development: Gender Agriculture Sourcebook. The World Bank, Food and Agriculture Organization, and International Fund for Agricultural Development. 16th Biennial International Institute of Fisheries Economics and Trade Conference. (2012). Proceedings of the Special Session on Markets and Value Chains for Small Scale Aquaculture and Fisheries Enterprises with a Focus on Gender. Co-Chairs: Merly Williams and Hillary Egna. Dar es Salaam, Tanzania. July, 2012. Williams, M., et al. (2012). Improving Gender Equity in Aquaculture Education and Training. Asian Fisheries Science. Special Issue Publication, Vol.25S. Egna, H., Reifke, L., Gitonga, N. (2012). Improving Gender Equity in Aquaculture Education and Training: 30 Years of Experiences in the Pond Dynamics/Aquaculture, Aquaculture, and AquaFish Collaborative Research Support Programs. Gender in Aquaculture and Fisheries: Moving the Agenda Forward, Asian Fisheries Science Special Issue. Vol.25S. Pp119-128. Egna, H., Gitonga, N., Reifke, L. (2011). Challenges of Including Gender Dimensions in Biotechnological Reseach. AquaFish CRSP PowerPoint presentation.Third Global Symposium on Gender in Aquaculture and Fisheries (GAF3), 9th Asian Fisheries and Aquaculture Forum, April 2011.